This article is about the director and producer. For the planetary scientist, see Christopher McKay. McKay was born in Winter Park, Florida, but spent most of his childhood in Chicago, Illinois. Growing up, McKay was inspired by Alfred Hitchcock films and decided to pursue film. He shot his earliest work on his parent's Super 8 film camera. McKay attended Southern Illinois University for two years as a film student, and completed his degree at Columbia College Chicago. While studying in Chicago, McKay attended his first film shoot-for the 1989 comedy Uncle Buck. In his early career McKay worked at several video and equipment rental companies. After purchasing production equipment of his own, he worked for three years shooting and editing music videos, industrial videos and local films. Then he started an editing job at a production company where he completed his first film 2wks, 1yr. McKay started his career as an editor, after leaving that company he first edited a film of his friend, titled Kwik Stop. In 2004, McKay moved to Los Angeles and landed an editing job at the animation studio ShadowMachine. He started work on the first episode of Robot Chicken, a stop motion adult animated sketch comedy TV series created by Seth Green and Matthew Senreich. McKay created and voiced the series' first end title sequence. In 2006, McKay started work on animated series Moral Orel for Adult Swim. whose creator Dino Stamatopoulos once said to him that he "really deserve[d] a producer credit" on the series, on which McKay replied that he would "really like to do is direct." So in the second season of the series, Dino let him direct more than half episodes out of twenty episodes and also from the third season. His work on Moral Orel impressed Matt and Seth, who offered him to direct Robot Chicken and in 2007, McKay directed the third, fourth, and the fifth seasons of the series, aired on Adult Swim. In 2007, McKay worked as editor and visual effect artist on the special episode Robot Chicken: Star Wars with Seth, which aired on June 17, 2007. Then in 2008, he also worked on the Robot Chicken: Star Wars Episode II as co-producer and animation editor. In 2010, McKay directed and co-produced the final installment of the special episodes, Robot Chicken: Star Wars Episode III. In 2009, McKay co-produced and directed the complete first season of the animated sci-fi adventure series Titan Maximum on Cartoon Network. In 2011, Warner Bros. hired McKay to join directors Phil Lord and Christopher Miller on the live-action animated The Lego Movie to co-direct the film's animation, the film was released domestically on February 7, 2014 and grossed over $468 million against a reported budget of $60 million. While Lord and Miller were working on 22 Jump Street, they sent McKay to Australia to supervise all animation, editing, effects, lighting and rendering of The Lego Movie. In March 2014, Warner Bros. set McKay to direct the sequel to the 2014 hit The Lego Movie, which Lord and Miller would produce, and Michelle Morgan and Jared Stern would write. On October 10, WB announced the spin-off film The Lego Batman Movie, pushing back The Lego Movie Sequel and fast-tracking development. McKay directed The Lego Batman Movie, which was released on February 10, 2017. Seth Grahame-Smith co-wrote the screenplay, while Will Arnett reprised the voice of Batman. In February 2015, Warner Bros. announced the development of a theatrical Adventure Time animated film adaptation, which would be produced and written by creator Pendleton Ward and produced by Roy Lee and McKay. In March 2015, McKay signed a first look deal for being a producer with Warner Bros.
McKay is currently developing and is attached to direct Nightwing, as a part of the DC Extended Universe, and is also set to direct an adaptation of Jonny Quest. as well as a sequel to The Lego Batman Movie. ^ a b c d e f g h i "Interview: Chris McKay [part 1]". yourdailyjoe.com. Retrieved July 23, 2015. ^ a b c "Interview: Chris McKay [part 2]". yourdailyjoe.com. Retrieved July 23, 2015. ^ McNary, Dave (November 11, 2011). "Warners greenlights 'Lego' feature". variety.com. Retrieved July 23, 2015. ^ "The LEGO Movie (2014)". boxofficemojo.com. Retrieved July 23, 2015. ^ Sarto, Dan (February 10, 2014). "Supervising Animator Chris McKay Talks 'The LEGO Movie'". awn.com. Retrieved July 23, 2015. ^ Fleming Jr, Mike (March 12, 2014). "Warner Bros Builds 'Lego' Sequel With Chris McKay Directing". Deadline Hollywood. Retrieved July 16, 2015. ^ a b Kit, Borys (October 10, 2014). "'Lego Batman' Spinoff Movie in the Works at Warner Bros. (Exclusive)". hollywoodreporter.com. Retrieved July 16, 2015. ^ Busch, Anita (February 27, 2015). "Cartoon Network's 'Adventure Time' Heads To Big Screen At Warner Bros". Deadline Hollywood. Retrieved July 23, 2015. ^ McNary, Dave (March 6, 2015). "'Lego Batman' Director Gets First-Look Deal at Warner Bros. (EXCLUSIVE)". variety.com. Retrieved July 16, 2015. ^ a b Ford, Rebecca (February 23, 2017). "Warner Bros. Plotting Live-Action 'Nightwing' Movie With 'Lego Batman Movie' Director (Exclusive)". The Hollywood Reporter. Retrieved February 28, 2017. ^ a b Zinski, Dan (November 8, 2018). "Jonny Quest Movie Lands LEGO Batman Director Chris McKay". Screen Rant. Retrieved November 8, 2018. 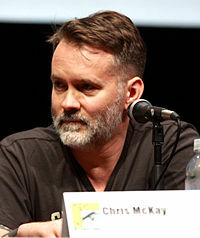 Wikimedia Commons has media related to Chris McKay.